A. FOR A CHARCOAL GRILL: open bottom vent completely. Light large chimney starter filled with charcoal briquettes (6 quarts). When top coals are partially covered with ash, pour evenly over grill. Set cooking grate in place, cover, and open lid vent completely. Heat grill until hot, about 5 minutes. B. FOR A GAS GRILL: turn all burners to high, cover and heat grill until hot, about 15 minutes. Leave all burners on high. Clean and oil cooking grate. Pat chops dry with paper towels and spread softened butter sugar mixture evenly over both sides of chops. Place chops on grill, cover, and cook until well browned and chops register 145 degrees, 3 to 4 minutes per side. Transfer chops to platter and top with chilled butter chive mixture. Tent loosely with aluminum foil and let rest for 5 minutes. Serve. 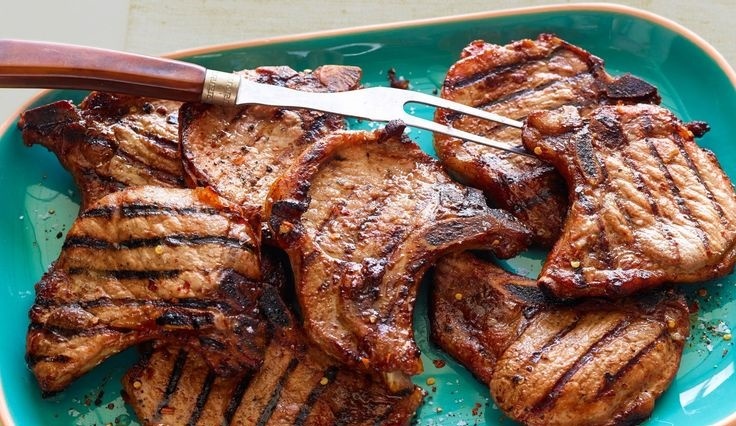 Variation: Spicy thai thin cut pork chops: substitute 1 ½ teaspoon chili garlic sauce, 1 teaspoon minced fresh cilantro, and ½ teaspoon grated lime zest for chives, mustard, and lemon zest. End.